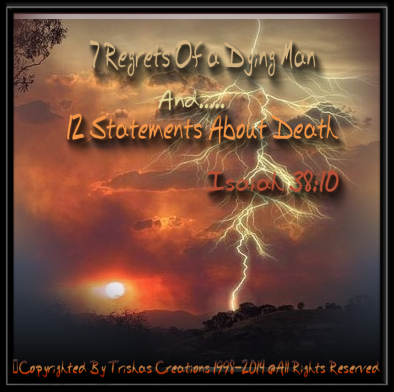 "7 Regrets Of a Dying Man & 12 Statements About Death"
Welcome to "7 Regrets Of a Dying Man & 12 Statements About Death"
When people die and they are aware of them dying, can you imagine what thoughts go through their minds. I wondered this when my sister was dying, in June on the 19th of 2014. Because she wanted so much to be accepted by her girls, and for them to want her in her life, but they refused, but when she was on her death bed, all wanted to be there and say their pleads of forgiveness before she passed. All the thoughts, she may have been thinking, and us not even be aware of her thoughts, because she wasn’t able to speak due to the tubes in her mouth. All, she wanted was to be able to love her girls and them want to love her and be around her, and her grandkids, but I felt so sorry for her, because of the love she had for her girls, and most didn’t want nothing to do with her until she was dying. Or, maybe she knew deep inside she was dying but just didn’t want to tell those that truly loved her, because she knew it would hurt them, and I do believe this, because there were many times I didn’t believe her telling me she seen Jesus, and now I know she had to have seen Jesus because she was dying. I have listed a few regrets of a dying person which the title is man but we all are considered dying person when we are dying, it doesn’t necessarily have to be a man. 7. My Life is Cut off Like A Weaver taking His Work From The Loom and Departing with it. These that are mentioned are just Ideas, they don’t imply extinction of being, annihilation or unconsciousness, they simply indicate a removal into another realm of activity, or being taken from one place to another, as a tent is removed or a piece of weaving is cutt off from the loom.